If you ask most people where the birth of the American cattle industry was, you're likely to get answers ranging from Texas to Arizona. Most people have no idea that the first cattlemen to set foot in the new world did so right here in the Sunshine State. Spanish explorer Ponce de Leon's arrival in 1521 with a small herd of Andalusian cattles and horses would signal the beginning of an industry that would give birth to an American icon; the cowboy. By the 1800s, pioneer cattlemen were moving thousands of cattle across the peninsula and Florida beef cattle were making a significant impact on Florida's economy. During the civil war, Florida beef played a major role in the Confederate war effort, and helped to keep Florida from slipping into the deep economic depression that much of the rest of the south suffered when the war ended. 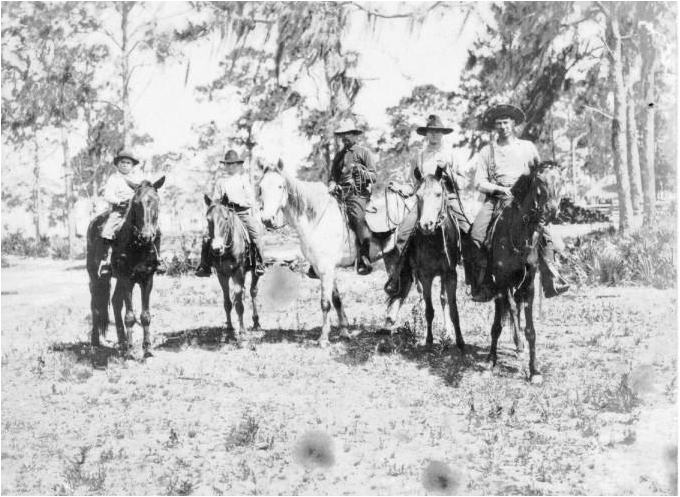 Indian wars, battles over the open range, massive cattle drives and real life characters that rival the likes of Wyatt Earp or "Buffalo" Bill Cody were common place in Florida's open range long before the dime novels of the west made them a part of Americana.